The sound of laughter fills the air, accentuating an already positive atmosphere. The strange but delicious combination of hotdogs and cotton candy gets your stomach growling, and as you look to your child, you see their bright smile shining, mimicking the sun on this beautiful day. There’s no way they can be any happier. Right? Just as this thought crosses your mind while you turn the corner, you hear your child emit a quiet gasp and feel a gentle squeeze of the hand. As you look up, you realize you were wrong about them reaching another level of happiness. Looming over you, basically radiating in the sun, stands a house that has been bringing joy to children (and some adults) for years. Not only a house, nay, a bouncy house! 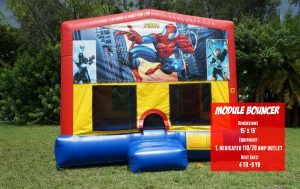 At Celebration Source, we bring the party to you, and one of our most popular activities for children attending our party entertainments in West Miami is our bouncy house. It’s fun, it’s safe, it’s an activity every child can enjoy, and did we mention that it is fun? 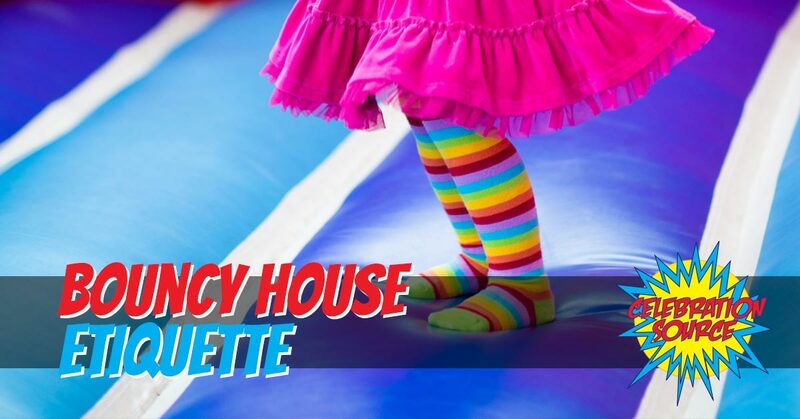 While the bouncy house is a sanctuary for kids to let it all out and jump, fall, spin, and most importantly, bounce, we do have a couple recommendations when it comes to bouncy house etiquette to ensure that the children are safe, the bouncy house is clean for others to enjoy, and that no minor disasters take place. Unless they’re wearing their favorite set of sneakers, this rule shouldn’t be very hard to implement, given it’s difficult to have children keep their shoes on in thefirst place. There are a few reasons why we ask all the children to take their shoes off. It will prevent mud, dirt, gum, and who knows what else from getting spread around. It will also lower the chances of injury. With so many limbs flailing about, it wouldn’t be surprising if a foot meets a face during the enjoyable chaos. Keeping shoes from outside of the bouncy house will also help make sure that the house doesn’t receive any rips or tears. If the bouncy house goes down, there will be a lot of devastated children. The food is part of the fun at a carnival event. The kids get permission to stuff their bellies with foods that aren’t usually allowed in their diet. Cotton candy, hot dogs, popcorn, funnel cakes, caramel apples, all being chewed with a smile. We don’t recommend not letting the kids partake in this delicious, but not necessarily nutritional, feast. All we’re saying is that a belly full of carnival food and enthusiastic bouncing do not go well together. This rule applies for our rides as well. Just let the food digest a little bit before the kids involve themselves in any bouncing, spinning, fast-paced activities. No one wants to see a bouncy house full of multi-colored vomit. Trust us. Not only will this shutdown the bouncy house temporarily, but it just might traumatize some of the young ones. We feel like this rule applies in everyday life with young children, but just in case, please don’t allow your children into the bouncy house with any sharp objects. This is a safety hazard for any of the other children around, as well as increasing the chances of the house gaining a hole. Have you ever seen a deflated bouncy house? It’s devastating. Slowly losing air until it lays limp on the ground, a heap of rubber representing infinite sadness. The kids will cry, the parents will have to console them, no one will win. So, please prevent this by making sure your child doesn’t have anything sharp in their pockets before entering the bouncy house. While we encourage a little bit of roughhousing inside of the bouncy house, it’s part of the fun, we do ask that you keep an eye on the kiddos while they’re inside to prevent any type of young aggression to fester. While your child will be very occupied having the time of their lives, that doesn’t mean that the unexpected argument won’t arise. The bouncy house is a place of joy! So there is no room for fights! Weight distribution is key when it comes to keeping the bouncy house upright and delivering the highest bounces available. So we like to keep participants around the same size and weight. With a heavy adult on one side and a child on the other, the bouncy house will lean heavily to one side. This will also keep some injuries from occurring. We like to keep our bouncy house clutter free, and extremely sanitary. This prevents germs from spreading, and kiddos faces and hands from rubbing up against spit, boogers, and other unpleasant things that children unwittingly spew. We just ask for a little help. Please have your children wash their hands before and after leaving the bouncy house. This is for us, and for you and your family as well. We don’t want germs to be picked up and leave your family sick. Celebration Source is proud to be your one-stop shop for all of your party entertainment needs. From carnival celebrations to corporate events and college festivals, we bring the party to you! We are committed to bringing a smile to your face and give your friends, colleagues, and peers a party that they will never forget. Make your next event one for the books, be sure to contact us today and get ready to party!